I ran across this yesterday. Good Halloween-themed thing. Darren Pearson, "Light Goes On." Mostly today at work I was hosting Halloween parties for groups of elementary students. I guess it ends up being the most important "holiday" event at our hagwon - which makes sense: Halloween is essentially the U.S.'s "children's day." But also today, I found out that several of my longest-term students in my most advanced middle-school class are leaving our hagwon. I was quite sad to hear this - I've been out of touch with the Tuesday-Thursday cohorts because of my post-cancer part-time status, so I haven't been following events as closely as I normally try to do. Walking home from work, I was quite moody and sad, thinking about how I've known two of these departing students for the entire time I've been teaching at Karma - since May of 2011. It's hard to see them moving on, but, of course, that's what students do. Unlike public school teaching, there's not really any such thing as a "yearbook" for hagwon students. I began to daydream and speculate as to how a hagwon yearbook might be done - it can't be based on fixed enrollment periods, since students are constantly coming and going. It would have to be monthly. With some appropriate technology (e.g. social networking of some kind) I think it wouldn't be hard to make a hagwon "yearbook," however. It would be more like a "monthbook." I should discuss this with my boss. I stepped on my little Tesco bathroom scale this morning and it said 76 kg. That's 168 lbs. I've never had a reason to distrust this scale - it was more-or-less in sync with my official weigh-ins during my radiation treatment. Here's the thing: the last time I weighed less than 170 lbs was 1990. I passed it going the other direction while in basic training for the US Army - "bulking up" they called it, as I got in shape. Before that, I had always been a skinny person. And since the US Army, I have always been a fat person. Permanent metabolic changes were either wrought by my army experience or else corresponded with it. I peaked in 1998 at around 260 lbs (120 kg), with another peak at about the same in 2005. The key to my current weight is simple: the "amazing cancer diet" works! Just make sure that eating is more painful than exercise, and you're set. The '-een' in Halloween means "eve." So Halloween Eve should be called Halloweeneen. We had Halloween parties at the hagwon for the Monday-Wednesday-Friday cohorts of elementary kids. It was more tiring than teaching regular classes. I'm exhausted. At right is a picture of me with two girls who wore costumes. I wore a costume too, although it was a bit of a stylistic mish-mash: the original (a few years ago) was Zorro. But I don't have my plastic sword, so I was using a giant inflatable plastic hammer. And I don't have my mask on. It appears I'm a psycho sneaking up on them. That wasn't really the intent of the picture, but it works for Halloweeneen. My middle-schoolers, in reaction to my costume, said I resembled a younger, more dangerous Dumbledore (of Harry Potter). I wasn't sure I should feel flattered by that. Auld Daddy Darkness is no wantit yit. An' Auld Daddy Darkness will flee far awa'. For Auld Daddy Darkness is kindly to a'. So Auld Daddy Darkness is better than he seems. Till Wee Davie Daylicht comes keekin' owre the hill. This Scots English Halloween poem is so densely Scots that it's pretty hard for me to understand. But it seems appropriate on Halloweeneen. Sometimes I listen to Korean pop radio - streaming on my computer so it's easy to look up songs and stuff. I hear this song by a group called 버스커 버스커 [busker busker] a lot and decided to look it up today. I like the cartoony image (is it an album cover?) I found on the lyrics site. Anyway, the song is really a bit yodelly for my taste, but it's not bad. 버스커 버스커 [busker busker], "처음엔 사랑이란게." If [you] don't speak, not even the ghost knows. That is to say, speak your heart, or no one can know it. I had an easy day today - only one class. Tomorrow is my last "day off" from work, as I go back to full time officially on Friday, November 1st but unofficially on Wednesday, to assist with the Halloween Party. I guess it's good I have a few more easy days - I had a pretty upset stomach yesterday and especially this morning. Bleah. I suspect (but don't know for sure) that it's related to the withdrawal of the painkiller. In any event, despite the upset stomach, I'm not feeling much (intolerable) pain in my mouth. I have only taken a few ibuprofin since last week, mostly on Saturday night when I had a headache. Furthermore, I ate a piece of bread this evening. That might sound insignificant, but if you know how I've been eating, you'd realize it's big progress. OK then, that's enough of my health-status update. More later. My Life with the Thrill Kill Kult, "Lucifer's Flowers." Ayn Random sounds so much more interesting that mere Ayn Rand, don't you think? This comic made me laugh a lot. There was a time when I was quite the fan of Ayn Randian thinking. I've changed a great deal, I think. My recent years in South Korea have turned me into some kind of liberto-communitarian. Is there such a thing? On a more philosophical and serious note, I was reading this excellent article, contrasting the Rawlsian fact and the Nozickian ideology of the current American polity. Perhaps South Korea is compelling because at least in its current historical moment, it is kind of an inverse: a Nozickian fact embedded in a Rawlsian fantasy (although yes that's an exaggeration - just look at healthcare as an example; I guess my point is that SK is less Rawlsian than it pretends, while the US is more Rawlsian than it pretends or hopes). Nancy Sinatra, "Burning Down the Spark." The kids from Montreal have an awesome new song that I listened to about 10 times today. David Bowie heard them working on it, and liked it so much he joined them signing - you can hear his distinctive voice. Plus, I drew this picture of a skeleton dreaming (ink and watercolor). But I see you on the other side? I dreamed about a chair. This is no joke. The whole dream was about a chair. I can't even explain it. It was just there, like on this huge flat plain, standing there like a monument, but not a big chair or fancy. A kitchen chair. There were tourists who would come by to see it. There were pictures of it on the news and on the internet. It was the sort of dream where I would wake up and think, "OK, that was weird," and then go back to sleep and end up right back in it. I wanted to somehow capture it. But what can I do? What's to describe? A chair. What's to draw? A chair. Here is my dream. Muse, "Thoughts of a Dying Atheist." It's Sunday. I take the dream to mean I need to stop and rest. I intend to try to avoid my computer and phone today. See you later. During my Saturday Special Speaking-only class my student handed me this card. I'm not sure what it means, but I tried to figure it out. It says, "데헷~ 귀요미 윤디쨩". "쨩" [jjyang] means "best" as in "number one person." I'm pretty sure she meant that she, herself, is cute and best at something. I wish I was better at figuring out this type of "found Korean." Since Thursday, I've stopped taking the prescription painkillers. I'm not sure I was really ready to stop, but during my visit with Dr Jo he seemed surprised I was still taking them, and, since I've always preferred to be "ahead of the curve" on these things, I thought to myself, "maybe there's a bit of a habit aspect to it." So I stopped. I do still have a lot of discomfort, but it's mostly tolerable. This morning my mood was surprisingly positive and good - enough that I've decided the opioids were probably depressing me a little bit, or affecting me in some way like that. I know that was the case with the really heavy stuff, which I'd stopped some time back with the feeling they were too much of a downer. Anyway, now I'm prescription-free. I have some cute plush bendy-snakes. I bought them for 3 bucks each at a stand outside the Korean Folk Village some weeks ago. I have been keeping them at my desk at work. One is lavender and the other is neon green. My younger students stopped by my desk earlier today and arranged them in an intertwined way over the cubicle divider. "They are couple," one girl explained. All Koreans know the Konglishism "couple" - even 8 year olds. "I see," I said, thinking nothing of it. Later, I was sitting at my desk, and a 6th grader (about 12) named Sangjin came by. He studied the snakes with a sort mock shock or disgust on his face. "Teacher, what is ... happening?" he asked, gesturing at the snakes. "My younger students did that," I explained. "They said they are a couple." Sangjin nodded sagely. "Teacher," he said, with a pregnant pause. "I think that is very serious." He got the intonation exactly right, too, dropping his already-changing voice a near-octave on the word "very." I have to work today but it feels like I have a little vacation. That's probably good. I plod my way through my breakfast, and add an extra layer against the cool morning air, rather than shut my window. My coffee is not just lukewarm but almost cold, because I have let it sit so long on my desk. I don't mind - my mouth is still temperature-sensitive, so I definitely prefer that to hot. I need to do something creative, but I'm feeling exhausted. I guess I'll... surf some art sites on the internet. I found this picture. It was brilliant and funny. I hope the author doesn't mind my reposting it here. My coworker May took a lot of photos last weekend when we went to Ganghwa Island (강화도). She forwarded some of them to me today so I'll post a few here. I like this one of me looking meditative going down the stairs. In so many pictures of me, I look like I'm grimmacing in pain. Heh. Of course. I like this one of Helen with Jacob. Helen told me she had a very hard time understanding Jacob, and couldn't figure out if it was his Australian accent or the fact he's 15. I suspect a combination of both. Today after leaving Jacob and my mom at the airport, I raced back to Ilsan to make my 1 pm appointment at the hospital. I got my CT scan and then had a short consult with Dr Jo. I'm so tired. I got home around 4 and crashed into napland. I woke up just now and will post this and go back to sleep. "What do you get when you cross a joke with a rhetorical question?" I guess this will be a less thematically-organized blog post than usual. Just call it a journal-like summary of the day. For her last day here, my mother wanted to return to 영천사 [yeongcheon temple] which is the temple on the hill closest to my apartment. I had taken her and Jacob there not long after they arrived. This time, Jacob didn't come - he went to do his own thing. Ann and I took a taxi to the very top, this time, though it was more expensive and a bit complicated to explain to the taxi driver, since the temple isn't well known and isn't on the typical online Korean map (not sure why that is). We sat and watched a funeral taking place at the temple, and talked quite a bit, and walked back down the mountain slowly and came back home. I took her to work to meet the rest of my coworkers that she hadn't met yet - but they were all fairly unsocial (shy? too busy? uninterested?). Then I sent mom home and taught my three classes. My first class was one of the so-called "CC" classes (the origin of this term remains mysterious to me), where we listen to pop songs in English and try to write down their lyrics and sing along. So I found myself singing. I guess the song is an old theme song from the Pokemon movie - but the kids didn't recognize it, as the movie is probably too old to be familiar to them. My last class was my middle school TOEFL class, and we did a practice debate about nuclear power in Korea. Now I'm having technical problems getting the video file off my camera. Tomorrow I go to the airport to drop off my mom and Jacob, and then I go to the hospital to get my follow-up, post-radiation CT scan. M2M, "Don't Say You Love Me." According to an article in the Korea Herald, a Korean family (mom, dad, 3 kids) took the family mini van to Portugal, via a ferry to Vladivostok and long drive across Siberia, Russia, Finland, Sweden, Denmark, etc. They have been photo-blogging about it. Now they plan to drive back. This is awesome. It's hard to explain all the ways that this is so fascinating to me. I think on the one hand I love the idea of that kind of trans-Russian adventure, and have fantasized about it for years. But the idea of doing it as a family, like as a sort of "family outing," it cool too, and makes it into the stuff of a kind of unconventional novel - not to mention my own childhood trekking across the Cascades or the Rockies or British Columbia with my sister, parents, Peggy, and a dog in a Model A Ford. Finally, it's interesting to see Koreans, specifically, doing things like this because they have a bit of a cultural reputation for being so, um, (pen-)insular... this is a nice antidote. Here is a screencap of a picture of them setting out, at the Sokcho ferry terminal where you catch the boat to Russia (because North Korea - if it weren't for that, one could just drive all the way to Portugal directly). I like it because I was just in Sokcho last week. Before my mom leaves on Thursday, I really wanted to go to my favorite restaurant and eat real food, instead of just eating around the edges of real food at various places which is my current capacity. So we went to Seoul and did some souvenir and gift shopping and also visited my favorite restaurant, which is the Russian place that keeps changing its name near Dongdaemun. We ordered lots of things. I was more-or-less able to eat some svekolny and borsht, but having some dumpling and kefir where perhaps pushing a step too far. The biggest obstacle: my mouth's sensitivity to acidity and spice in foods is less than it has been, but it's still a big problem. Anyway, we had some Russian food which was very delicious, we bought some books and other things in and around Insa-dong, and we walked around some. Tomorrow I work, so today was really my last chance to be "tour guide" for my mom and Jacob. They'll fly back to Queensland on Thursday. Here's a picture at the Russian restaurant. Pie invisible de la ira. Por alguna razón salió de mi conciencia, al despertar, el nombre del poeta Alberti. Me hizo recordar el año 96, cuando en la universidad de Penn estudiaba con el profesor López, a quien si bien me recuerdo le gustaba citar a Alberti. Poeta difícil para mí, siempre lleno de aire y caballos y mar. Alberti también hacía artes visuales, por ejemplo el dibujo arriba. I asked the doctor during my check-up earlier today how long it would be before my mouth started to feel normal. He said, "oh, maybe three to five years." This was in specific reference to my messed up salivary system, and not in reference to my pain, which presumeably will improve sooner. Hopefully. I want to eat normal food. This is a proverb from my proverb book. 신선 노리에 도끼 자루 썩는 줄 모른다. [A man] at play with the faeries doesn't realize [his] ax-handle is rotting. The book explains that it is based on a fairy tale about a woodcutter who goes into the mountains and plays with wood nymphs or sprites and forgets the world, and only awakens from his reverie as a bent old man with a rotting ax-handle. It seems similar to the story of the lotus-eaters in Homer, but there are many stories of people losing track of their regular lives in lost reveries by falling under enchantment. In looking up the proverb online, there seems to be a more common grammatical variation on this proverb that begins "신선 놀음에..." - this is just substituting 놀음 (a gerund of the verb "to play") for the related noun meaning "play". I doubt this temple-panel picture has anything to do with the story, but it seemed to share something of the same atmospherics, at least to my mind. I drove around Ganghwa Island (강화도) today with my mom, Jacob, Helen and May. First we went to lunch and had traditional galbi-style cook-at-the-table fare. Then we went to 전등사 [jeondeung temple], which I'd visited with my friend Peter exactly one year ago. Finally, we drove up and saw a site called 연미정 [yeonmijeong], an old fortress location where Joseon Korea surrendered to China in a humiliting historical moment in the 17th century, but where now you can also look across the Han River estuary at North Korea. That's North Korea in the far background. A picture of all of us, taken by a nice man who was looking at the North with some binoculars. After all that driving around, we were tired, but then my boss Curt invited us to dinner with his family - his wife Migyeong and his daughter Nayun and son Baegang. So we ate 칼국수 [kalguksu = homemade noodle soup] made with lots of mussels (바지락) for dinner. Jacob ate a very large amount today but he wanted ice cream when we got home. I think he has recovered his appetite. Now we are home resting. 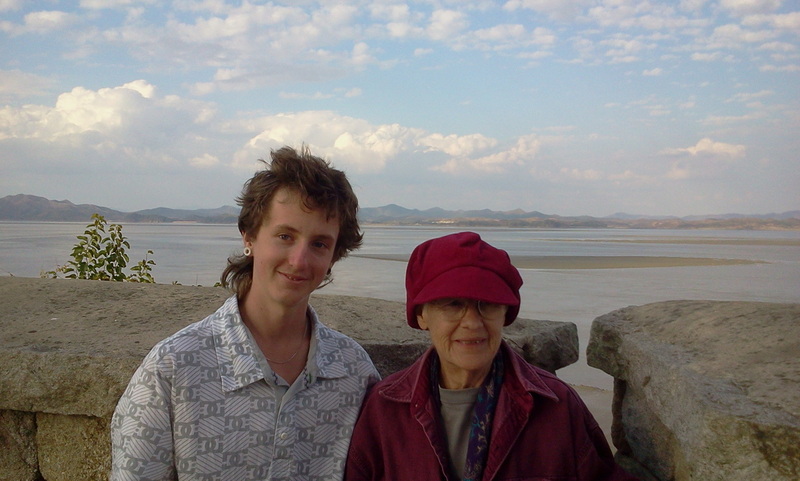 jacob and my mother with north korea across the river behind them. my coworkers helen and may have brought us to ganghwa island where ate meat with many side dishes. Over what I live for? Innocent of life as it were. Yet I pause to think. Drunk with delight of living. Man lives till he dies. I rather liked this poem, that I ran across in translation here. I was very frustrated because I spent almost two hours trying to find the original Korean text for this poem through various strategies of googlings, so as to be able to include it and try to read it, but I utterly failed. If any of my Korean-speaking friends who sometimes look at my blog would happen to recognize this poem and point me to the original text, I'd be grateful and interested. I will update this blog post if I run across the Korean text later. [Update: my friend Christine almost immediately recognized this poem and gave me a link to the original. She said they read it in middle school. I walked to work and then worked. I'm feeling pretty tired - burning out some from work and visitors and all that, and really, really annoyed and sick and tired of how long it's taking for my radiation-damage to heal. I still can only eat soft things and there are still constant migrating sores in my mouth, and it's been over three weeks since the radiation ended. Here is a picture the fall-colored trees along the middle of the street in front of work - KarmaPlus Academy is the yellow sign with blue and red lettering on the building that is in the dead center of the photograph. Caveat: "I sat in a corner and was alienated"
I took Jacob to hagwon with me this evening for a little over an hour. I had a full teaching load in the afternoon because I was doing some substitute classes, but then at 6:30 I brought Jacob into my TOEFL2 cohort, which is my most advanced class of kids who happen to be roughly Jacob's age. I would say that over all, it was a bit awkward. It's hard to get teenagers to interact when they're not wanting to. Jacob wasn't unpleasant about it, however. Later, when we got home, he said, "I sat in a corner and was alienated." This made me laugh. He seems to have captured the tone of the Korean educational experience, then. I will post some more pictures from Jacob's and my hike over the ridge at Bukhansan. We entered the park with my mother at 진관사 [jingwan temple] on the western edge, near the Gupabal subway station. Ann accompanied us through the temple and a few hundred meters up the trail until it suddenly got very steep on a rock face, then she went back down and waited for us while we went all the way up to 비봉 [bibong = bi summit]. Jacob actually went up to the summit but I was feeling a bit acrophobic after the trail up, so I waited for him. Then we proceeded down from the ridge to the other side, where 승가사 [seungga temple] was. That temple is much more inaccessible than most temples, since it requires a minimum of 2 km of hiking. It was quite beautiful. Then we walked down the long driveway (closed to traffic) and exited the park in a neighborhood called 구기동 [gugi neighborhood]. From there we took a 20 minute taxi ride back around to where we had started and re-met my mom. Here is a map, where I tried very roughly to estimate our route by following contour lines. Here are some pictures (unlabeled / roughly in order). 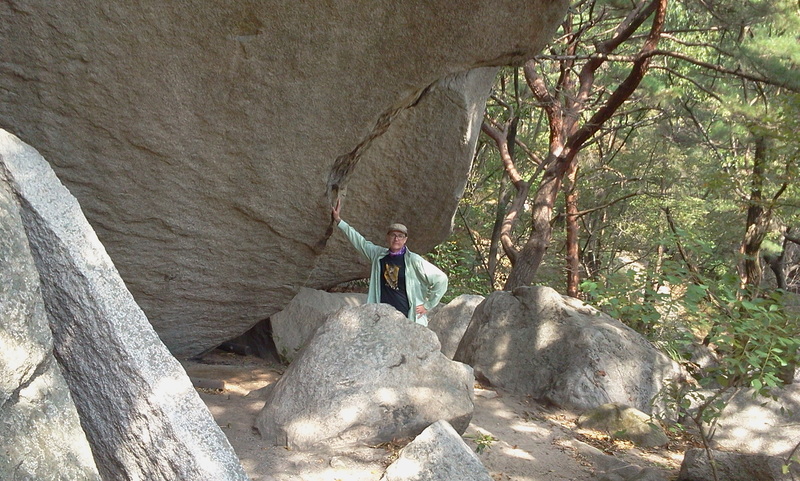 i am at a rock near 승가사 [seungga temple]. jacob took the picture inside bukhansan national park. Lately electricity prices have gone negative during peak hours in Germany, according to an aside in a recent article about Elon Musk's photovoltaic empire-building in California. The meaning of the idea of negative electricity prices is that because of everyone installing solar panels on their roofs and being on the grid, during sunny afternoons (which are peak electricity consumption hours) these buildings are pushing more power onto the grid than they're drawing off of it. Normally, afternoons are peak consumption times, and so coal-fired plants are also scheduled to peak production at these hours. The result is that suddenly the German electricity market is flooded with excess electricity, and prices go negative. Imagine all these coal-fired generating plants suddenly having to pay to put their electricity on the grid. In general, Germany is turning into a literal powerhouse of alternative energy - which is very interesting vis-a-vis other political and economic trends, both in Europe and world-wide. I've been doing a unit with my recently re-started debate class about the viability of nuclear power in South Korea, and part of that unit means discussing alternative energy sources as well - so this is worth reading and thinking about for me. Korea had placed some major bets over the last two decades on nuclear power, raising domestic dependency on nuclear power to around 30%, but the Fukushima disaster, so close-by, has been prompting some re-thinking. So far, I've been impressed with the Korean nuclear regulatory authorities' commitment to safety - rather than go on blithely after Fukushima, they have closely inspected all their plants both from a physical and procedural standpoint, in a clear effort to prevent a "next Fukushima." The consequence has been a huge electricity shortage in Korea, with more than half the nuclear production facilities shut down for inspections and repairs and upgrades. People find this alarming, but in fact, this is exactly how nuclear power safety should proceed, to be as safe as possible. So I take much solace in it. Nevertheless, the South Korean government has been examining the possibility of putting some of their eggs in other baskets, too. One possibility that is very promising here, on a peninsula surrounded on three sides by seawater, is tidal generation. The Shilwa project is an example of this. The picture, below (taken in June), shows an "electricity holiday" (정기휴일) banner on a closed store that was across the street from my old apartment near Juyeop. Most stores have these government-mandated "electricity holidays," and it was the reason the electronics mart was mostly closed the other day when I tried to take Jacob there. I'm quite sceptical about their ability to enforce power conservation in this way, but it is indicative of the scale of the problem, anyway. Cough cough cough cough cough cough cough cough cough cough cough cough cough cough. I guess something I ate (or rather, the manner in which I ate something), going down the wrong way. It's been several weeks or a month since I had that particular problem. Actually, before that coughing thing, I had a pretty good day. Last night I dreamed I was wandering around the Seoul subway - which is maybe realistic given I've been taking the subway a lot more, recently, due to my many visitors, than in my usual lifestyle. The subway was full of people from previous periods of my life - from my work in Burbank or Long Beach, from grad school at Penn in Philadelphia, from the US Army, from my undergraduate years at Macalaster and the University of Minnesota. I found a group of people that included some Burbank coworkers along with some acquaintances from my undergraduate years in a long pedestrian passage of the subway, where they were apparently staging a talent show. I was invited to join in, but I said I had no talent. So I sat down on the floor to watch. There were several children performing a puppet show, but the stage-window apparatus fell down, so they were just sitting on the floor holding the puppets up. All through this, regular subway patrons kept walking past, oblivious. Many of the people present were discussing the puppet show, saying how badly the children were doing. One girl had on a frilly dress and was weilding a dragon puppet and was having trouble disentangling the long tendrils attached to the dragon-puppet's head from the ruffles on her dress. You could see she was on the verge of tears with frustration. A boy had a puppet of a hunter or soldier, but he wasn't holding it up above his head, so he was blocking the view of it with his head and other arm. I felt compelled to defend the children's efforts against the criticisms of the audience, but I was being ignored. Finally, I gave up and wandered off through the subway again. I awoke and it was 4 am. My apartment had become quite chilly - the weather station on my phone said it was 5 degrees (C) out. I know my mother - staying with me currently - doesn't like cold, so I closed my window. I lay awake for a long time - for some reason the fragment of dream stayed vividly with me. 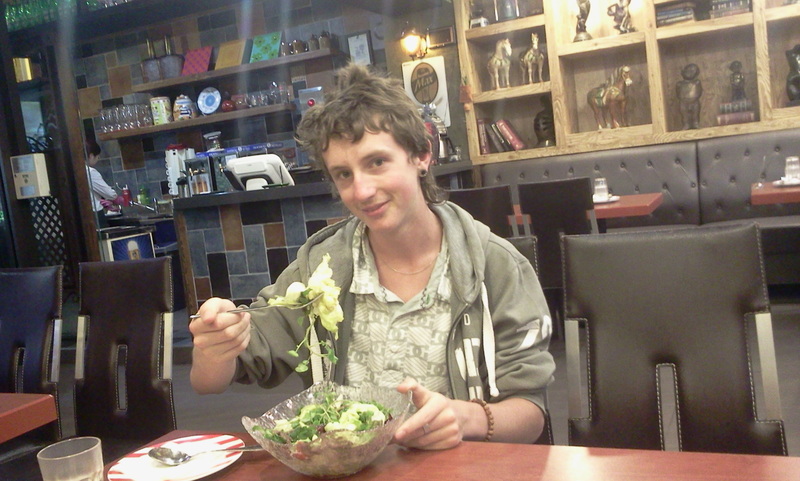 jacob found happiness in gangnam with a giant salad. his own gangnam-stylin.